Growing up in the Deep South, Natasha Trethewey was never told that in her hometown of Gulfport, Mississippi, black soldiers had played a pivotal role in the Civil War. Off the coast, on Ship Island, stood a fort that had once been a Union prison housing Confederate captives. Protecting the fort was the second regiment of the Louisiana Native Guards -- one of the Union's first official black units. Trethewey's new book of poems pays homage to the soldiers who served and whose voices have echoed through her own life. The title poem imagines the life of a former slave stationed at the fort, who is charged with writing letters home for the illiterate or invalid POWs and his fellow soldiers. Just as he becomes the guard of Ship Island's memory, so Trethewey recalls her own childhood as the daughter of a black woman and a white man. Her parents' marriage was still illegal in 1966 Mississippi. The racial legacy of the Civil War echoes through elegiac poems that honor her own mother and the forgotten history of her native South. 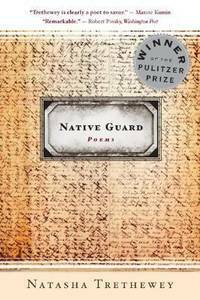 Native Guard is haunted by the intersection of national and personal experience. 2006-08-07. New. Ships with Tracking Number! INTERNATIONAL WORLDWIDE Shipping available. Buy with confidence, excellent customer service! Boston; New York: Houghton Mifflin Company, 2006. First Edition, First Printing. thin 8vo., 51pp. ; spine multicolored with black and white lettering; dust jacket protected with a mylar covering; previous owners information in ink on ffep; SIGNED on title page; text block clean; shelved Poetry. Shelved Dupont Bookstore. Houghton Mifflin Harcourt, 2006-03-06. 2nd. Hardcover. Used:Good. Boston and New York: Houghton Mifflin Company, 2006. First Edition. Hardcover. Fine/Fine. Winner of the 2007 Pulitzer Prize in Poetry. A native of Gulfport, Mississippi, Trethewey (b.1966) was appointed United States Poet Laureate in 2012 and again in 2014. Presentation copy, inscribed on the title page by Trethewey to social activist and longtime Claremont Graduate University president John Maguire. Octavo. A fine copy in a fine dust jacket. Mariner Books. PAPERBACK. 0618872655 New Condition. . New. Houghton Mifflin Company. Hardcover. 0618604634 New Condition. . New. Houghton Mifflin Harcourt, 2007-11-06. Hardcover. Used:Good. 2007-04-03. Good. Ships with Tracking Number! INTERNATIONAL WORLDWIDE Shipping available. May not contain Access Codes or Supplements. May be ex-library. Shipping & Handling by region. Buy with confidence, excellent customer service! Boston: Houghton Mifflin, 2006. First printing. Hardcover. Fine/Fine. First printing, 2006, hardcover with black paper boards in dust jacket, octavo, 51pp., not illustrated. Book fine with handsome boards and tight binding, text clean and unmarked. DJ fine. Houghton Mifflin Company. Hardcover. 0618604634 Like New Condition. . Fine. Mariner Books. PAPERBACK. 0618872655 Like New Condition. . Fine. MARINER. New. 8.26 x 5.66 cm. Used - Like New. Book in almost Brand New condition. Boston:: Houghton Mifflin,, (2007.). Fine in fine dust jacket (a new copy.) CD pocket is still unopened. . First thus. An attractive new edition of the author's Pulitzer prize winning collection of poems, poems which bring together two strands of the racial legacies of the South - many are a tribute to her mother, whose marriage to a white man in the 1960s was illegal in her native Missippippi and other poems which are a tribute to the role of the black regiment, the Lousiana Native Guards, during the Civil War. This edition includes a cd of the poems read by the author. In addition to her many other awards, in 2012, Trethewey was named US poet laureate. Notes. 49 pp. Condition: Fine in fine dust jacket (a new copy.) CD pocket is still unopened. Mariner Books, 2007-04-03. Paperback. Used:Good. Mariner Books. PAPERBACK. 0618872655 Remainder mark . Fine. Boston: Houghton Mifflin, 2006. First Thus. Hardcover. Fine/fine. First Thus. Hardcover. 2007 Pulitzer Prize Winner. Includes a CD of poems read by the author. Mariner Books. Collectible - Good. Signed Copy Collectible - Good. Signed/Inscribed by author on title page. Writing inside. Mariner Books. PAPERBACK. 0618872655 Minor shelf wear . Very Good. Mariner Books. Literature & Fiction. New. Brand New: This item is brand new unopened, never used and still in its original manufacturer condition. Houghton Mifflin & Co., 2006. First edition, in second issue dust jacket with Pulitzer emblem. Fine in fine dust jacket, in mylar cover. Winner of the Pulitzer Prize. Audio disc included. Edition: First edition, in second issue dust jacket with Pulitzer emblem. Mariner Books. PAPERBACK. 0618872655 We carry new, used, and remaindered books - some books may have remainder mark and/or underlining. We often have multiple copies per title - and have over 20,000 discounted titles available. Symposium Books is an Independent Bookstore with locations in Providence, RI near Brown University and RISD and in East Greenwich, RI. We are dedicated to providing our customers with the widest selection of scholarly, literary and quality art books. Expedited shipping is available. We pride ourselves on offering prompt, reliable customer service and a no hassle return policy. . New. Mariner Books. PAPERBACK. 0618872655 Special order direct from the distributor . New. Mariner Books. PAPERBACK. 0618872655 . New. Mariner Books. PAPERBACK. B002ECETZ4 . New. Houghton Mifflin Harcourt Publishing Company, 2007. Hardcover. Good. Disclaimer:A copy that has been read, but remains in clean condition. All pages are intact, and the cover is intact. The spine may show signs of wear. Pages can include limited notes and highlighting, and the copy can include previous owner inscriptions. At ThriftBooks, our motto is: Read More, Spend Less.Dust jacket quality is not guaranteed. Mariner Books. Paperback. 0618872655 . New. 2007-04-03. 1. Houghton Mifflin Harcourt, 2006-03-06. Hardcover. Good. Mariner Books. PAPERBACK. 0618872655 BRAND NEW, GIFT QUALITY! NOT OVERSTOCKS OR MARKED UP REMAINDERS! DIRECT FROM THE PUBLISHER!|0.5 . New. Mariner Books, 2007-04-03. Paperback. Good. Mariner Books. PAPERBACK. 0618872655 signs of little wear on the cover. . Very Good. Houghton Mifflin. Used - Very Good. Great condition for a used book! Minimal wear. Houghton Mifflin Company. Hardcover. 0618604634 Moderate edge wear. Binding good. May have marking in text. Dust jacket included if issued with one. We sometimes source from libraries. We ship in recyclable American-made mailers. 100% money-back guarantee on all orders. . Good. 2006. Mariner Books. Used - Like New. Like New condition. Mariner Books. PAPERBACK. 0618872655 9780618872657 . Fine. Mariner Books, 04/03/2007. Paperback. Used; Good. **WE SHIP WITHIN 24 HRS FROM LONDON, UK, 98% OF OUR ORDERS ARE RECEIVED WITHIN 7-10 DAYS. We believe you will be completely satisfied with our quick and reliable service. All orders are dispatched as swiftly as possible! Buy with confidence! Houghton Mifflin Harcourt Publishing Company, 2006. Hardcover. As New. Disclaimer:An apparently unread copy in perfect condition. Dust cover is intact; pages are clean and are not marred by notes or folds of any kind. An ex-library book and may have standard library stamps and/or stickers. At ThriftBooks, our motto is: Read More, Spend Less.Dust jacket quality is not guaranteed. Houghton Mifflin Harcourt Publishing Company, 2006. Hardcover. Good. Disclaimer:A copy that has been read, but remains in clean condition. All pages are intact, and the cover is intact. The spine may show signs of wear. Pages can include limited notes and highlighting, and the copy can include previous owner inscriptions. An ex-library book and may have standard library stamps and/or stickers. At ThriftBooks, our motto is: Read More, Spend Less.Dust jacket quality is not guaranteed. Houghton Mifflin Harcourt Publishing Company, 2006. Hardcover. Very Good. Disclaimer:A copy that has been read, but remains in excellent condition. Pages are intact and are not marred by notes or highlighting, but may contain a neat previous owner name. The spine remains undamaged. An ex-library book and may have standard library stamps and/or stickers. At ThriftBooks, our motto is: Read More, Spend Less.Dust jacket quality is not guaranteed. Mariner Books, 2007. Paperback. Acceptable. Disclaimer:A readable copy. All pages are intact, and the cover is intact. Pages can include considerable notes-in pen or highlighter-but the notes cannot obscure the text. At ThriftBooks, our motto is: Read More, Spend Less.Dust jacket quality is not guaranteed.